At any given point of time do you find yourself to be surrounded by nature, with all its beauty in the form of trees, plants, lakes, rivers, animals, insects etc.? Do you think there is some form of contact or collaboration between the living and the nonliving components of ecosystem? Read along to know more. Living organisms seem to interact amongst themselves and with the physical environment. This, in short, can be called an ecosystem. There can be different types of ecosystems. The biosphere, for example, can be a global ecosystem. It all depends on the different components and the extent to which you want to define the space, to consider it as an ecosystem. And hence to be able to learn more about them, ecosystems are generally divided into smaller forms. 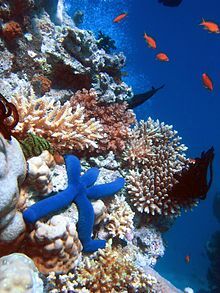 Ecology or environmental biology is the field that studies this complex set of relationships between the living organisms and their surrounding environment. The scope of this field is very large and covers things like global warming, environmental pollution, plant and animal extinctions etc. Learn more about Ecological Pyramid and Ecological Succession in detail here. There are two main components of an ecosystem which are in constant communication with each other. They are the biotic components and the abiotic components. The living components of an ecosystem are called the biotic components. Some of these factors include plants, animals, as well as fungi and bacteria. These biotic components can be further classified, based on the energy requirement source. Producers, consumers, and decomposers are the three broad categories of biotic components. Producers are the plants in the ecosystem, which can generate their own energy requirement through photosynthesis, in the presence of sunlight and chlorophyll. All other living beings are dependent on plants for their energy requirement of food as well as oxygen. Consumers include the herbivores, carnivores, and omnivores. 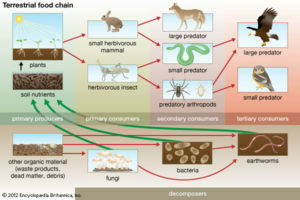 The herbivores are the living organisms that feed on plants. Carnivores eat other living organisms. Omnivores are animals that can eat both plant and animal tissue. Decomposers are the fungi and bacteria, which are the saprophytes. They feed on the decaying organic matter and convert this matter into nitrogen and carbon dioxide. The saprophytes play a vital role in recycling the nutrients so that the producers i.e. plants can use them once again. Abiotic components are the physical and/or the chemical factors that act on the living organisms at any part of their life. These are also called as the ecological factors. The physical and chemical factors are characteristic of the environment. Light, air, soil, and nutrients etc. form the abiotic components of an ecosystem. The abiotic factors vary from ecosystem to ecosystem. In an aquatic ecosystem, the abiotic factors may include water pH, sunlight, turbidity, water depth, salinity, available nutrients and dissolved oxygen. Similarly, abiotic factors in terrestrial ecosystems can include soil, soil types, temperature, rain, altitude, wind, nutrients, sunlight etc. Here, the sun is the energy source. Producers/plants use this energy to synthesize food in the presence of carbon dioxide and chlorophyll. The energy from the sun, through several chemical reactions, turns into chemical energy. Learn more about the Biogeochemical Cycle in more detail here. The herbivores are dependent on plants for the energy requirements. The carnivores, in turn, feed on the herbivores and other carnivores. At any level, microbes then decompose any dead and decaying organic matter. These decomposers, after various chemical reactions, release molecules back to the environment in the form of chemicals. The chemicals are again used by the producers, and the cycle starts again. In conclusion, ecosystems have a complex set of interactions that happen between the biotic and abiotic components. The components of an ecosystem are linked to each other through the energy flows and nutrient cycles. Even though ecosystems do not have clear boundaries, these interactions get affected, even if one factor is changed or removed. This ultimately has the capacity to affect the entire ecosystem. Q: From the following factors, demarcate the biotic and abiotic components — Sunlight, plants, water, animals, soil, insects, and fungi. Abiotic Components – Sunlight, Water, Soil.